Russia’s second city is second to none in its cultural offerings, which range from ornate palaces and treasure-filled museums to a well-cultivated arts scene. Here’s how to go about touring the grand sights of St Petersburg. St Petersburg was a city built from the ground up and constructed in a grand architectural style despite its unglamorous location in a swampy delta of islands. The brainchild of Tsar Peter the Great for whom the city was named, this “Window to the West” was intended to present a modern, international front to the western world and open Russia up for trading. Peter set about the project with gusto and the city sprung up at a rapid pace, claiming the lives of between 30,000 – 100,000 of the labourers tasked with this feat. As a result of Peter’s direct influence, the new city had a distinctly different feel, its Baroque palaces and Venetian canals differing from traditional Russian architecture. It marked the start of the city’s positioning as Russia’s cultural capital, one it still holds today. Over the years, St Petersburg underwent a number of name changes, becoming Petrograd in 1914 and Leningrad in 1924 before its original moniker was restored. For a long time, from 1732 – 1918, it also held capital city status. The changes underscored the importance of Russia’s “second city”, and the city remained a favourite amongst tsars and leaders who built over 200 palaces in the area during its lifetime. Today, St Petersburg is renowned as a hub for the arts and ballet and its city centre holds UNESCO World Heritage status. Those visiting St Petersburg will be spoilt for choice when it comes to cultural offerings. Not to be missed are the Hermitage Museum, one of the biggest and oldest museums in the world, and the vast Peter and Paul Fortress. Most tourists also head to Nevsky Prospekt, the main street that runs through the heart of the city. Follow this road and you’ll come across a treasure trove of sites, including Kazan Cathedral, the Church of Our Saviour on the Spilt Blood and a slew of restaurants and shops. It’s also a great place for some people watching. While Moscow often steals the limelight for its spectacular metro stations, those in St Petersburg are equally ornate and hold the additional title of being one of the deepest underground networks in the world. The system is well-oiled and reasonably priced, making it a good option for those looking to travel around the city. Alternatively, buses and taxis are easily accessible, as is the marshrutka, a mini-bus taxi which runs on a fixed route and can be hailed at any point along its course. 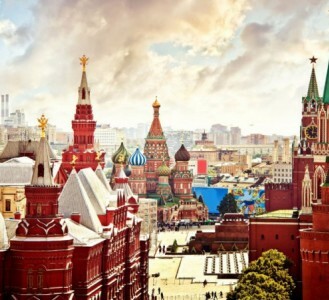 Take a break from sightseeing with a meal or refreshment in a Russian restaurant or café. Look out for those serving Russia’s best-known local dishes, which include pancake-like ‘blinis’, ‘borscht’ beetroot soup, ‘pelmeni’ stuffed dumplings and a stuffed savoury pastry called ‘pirog’. St Petersburg is also the birthplace of Vladimir Putin, giving you the novel opportunity to dine at the leader’s favourite local restaurant, Podvorye. Capitalise on your proximity to the town of Pushkin, located just 7km away, and take a day trip to this leafy area which is home to the magnificent Catherine Palace. Trains and buses run regularly from central St Petersburg to Pushkin. British passport holders must obtain a visa before travel to Russia. It’s an intensive process, so give yourself ample time to complete the required paperwork and have it processed. The currency in Russia is the Russian rouble (RUB). Most large hotels, restaurants and shops accept credit cards although taxi drivers typically only take cash. It is an offence to exchange money on the streets in Russia, so if you take foreign currency (dollars and euros are recommended), exchange it at banks or airport bureaus; it is illegal to make payments in foreign currency. Taking photos of military establishments or sites of strategic importance, including airports, is prohibited so take note of any signs stating this. The weather in St Petersburg can be very unpredictable, so be prepared for unseasonal rainfall or chilly days. St Petersburg’s annual White Nights festivities run from May to mid-July in celebration of the fact that the sun never sets during this period. Visit the city at this time of year and you’ll encounter festivals, fireworks displays, night-long revelry and a full programme of events.